DID YOU KNOW that Great Egrets’ feathers were used to decorate ladies’ hats, especially in the late 19th and early 20th centuries? The demand for feathers (especially “nuptial plumes” that emerge during breeding season) almost led to their extinction. The Audubon Society was instrumental in pushing for laws that protected these and other birds, and eventually public sentiment rejected the wholesale slaughter of birds for fashion use. AND ANOTHER THING: The Great Egret is the symbol/logo of the National Audubon Society. That is NOT A COINCIDENCE! How about one more factoid (ok, two)? 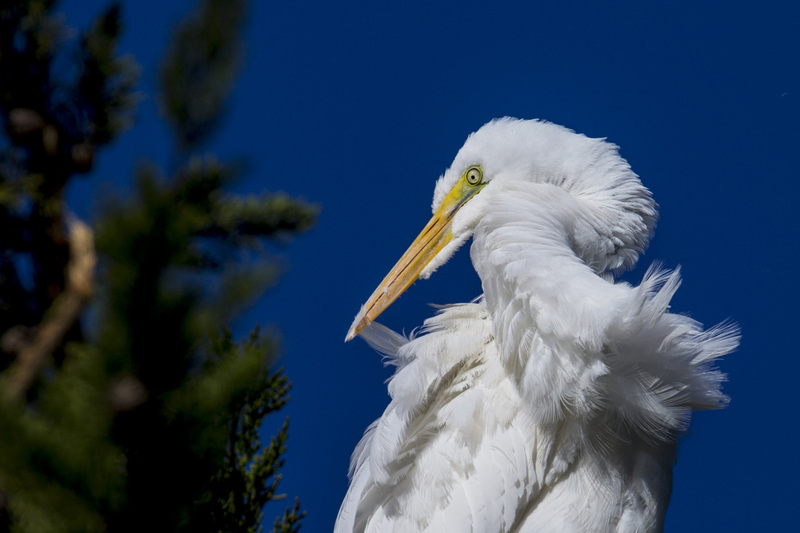 The typical wingspan of a Great Egret is about 4½ feet, and they can live over 20 years. Dragonflies are spectacular creatures and they eat lots of mosquitos. If you move close enough to get a really good look, you’ll be amazed, but that’s not always easy. They’re very fast flyers (actually, the fastest of all insects), change flight direction erratically, and they can even fly sideways and backwards. Well-kept secret I learned from a professional naturalist: Many insect photos are STAGED by capturing the insect in a net, placing the insect into a jar, and then cooling the jar in a refrigerator for a while to slow the bug’s metabolism to near-zero. Once cooled off, the poor creature can be posed like a doll and then photographed easily with plenty of time for the unscrupulous so-called photographer to focus and make other camera adjustments. It often takes several minutes for the insect to warm up, eventually wise up to the shocking indignity of this manipulation, and fly away in disgust. 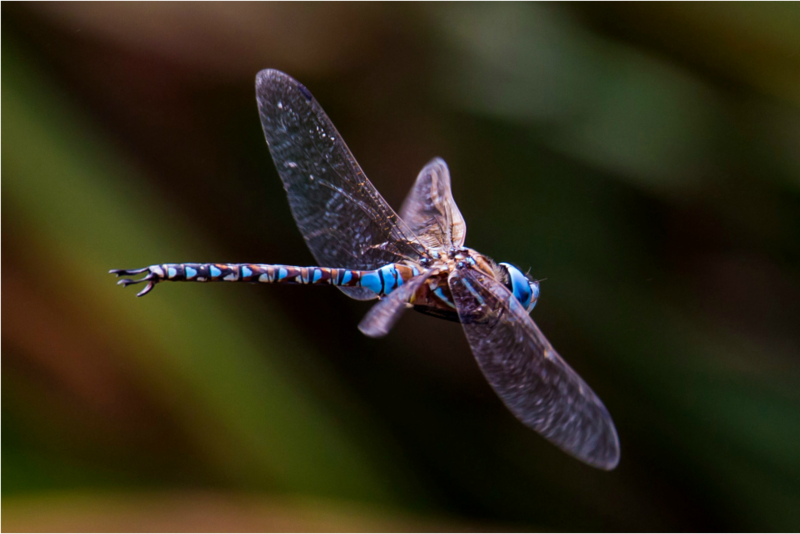 I’m very proud to say that I took this photo of an unrefrigerated blue-eyed darner -- in flight -- at Rodeo Lagoon (GGNRA) last Monday. WARNING: THIS PHOTO SHOWS SOME EXPLICIT NATURE STUFF that some may consider GROSS. Hey – it’s not all rainbows and unicorns out there! River otters are fascinating semiaquatic mammals. Although they are quite “cute”, playful, and look a little like puppies, they are carnivorous and very efficient predators. After 60 years of wandering around in Marin wild lands, I had never seen one there until very recently. I took the attached photo early this morning at Abbott’s Lagoon. An otter family group of about 4-5 was ‘sharing’ (manners not that great) this Double-crested Cormorant for breakfast. 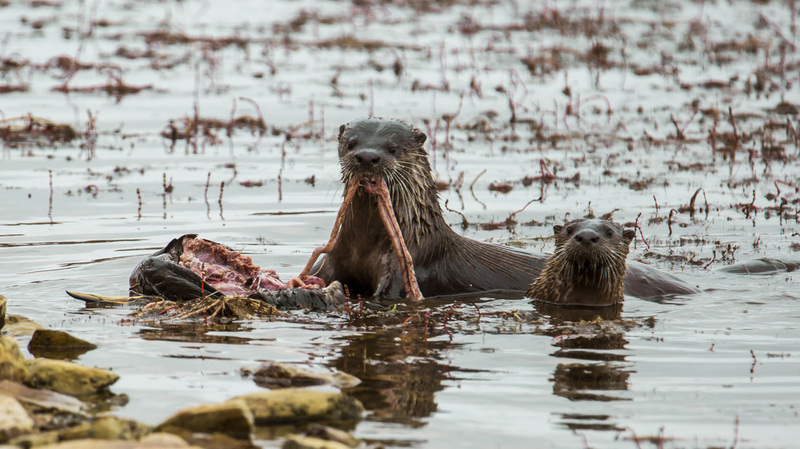 Although these are river otters, (i.e., NOT sea otters), they don’t seem to mind the estuarine (mixed fresh & salt) water of Abbott’s Lagoon. Early this morning I went back to see how the ospreys are doing, and it looks like they’re doing quite well. The two birds on the left (first photo) are the chicks, but they look just about ready to fly. Although they’re only a few weeks old, they’re almost as big as the adult on the right. 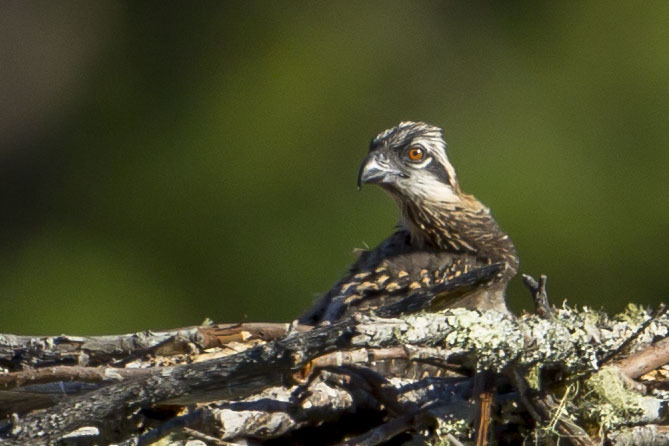 A younger chick in another nest about ¼ mile away looks quite different. Its feathers are just starting to poke out. 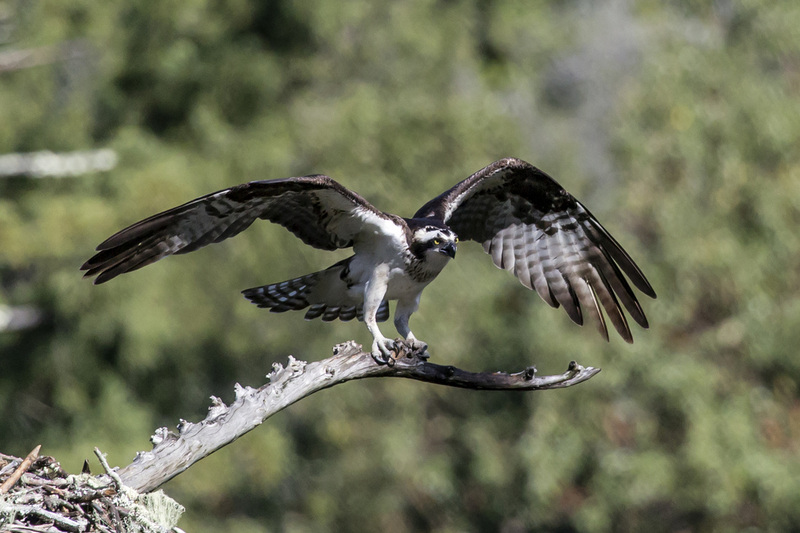 Early this morning I returned to the osprey nest on Kent Lake that I first visited on April 2nd. (Remember? I sent out a Creature of the Day photo of the female on April 10th.) 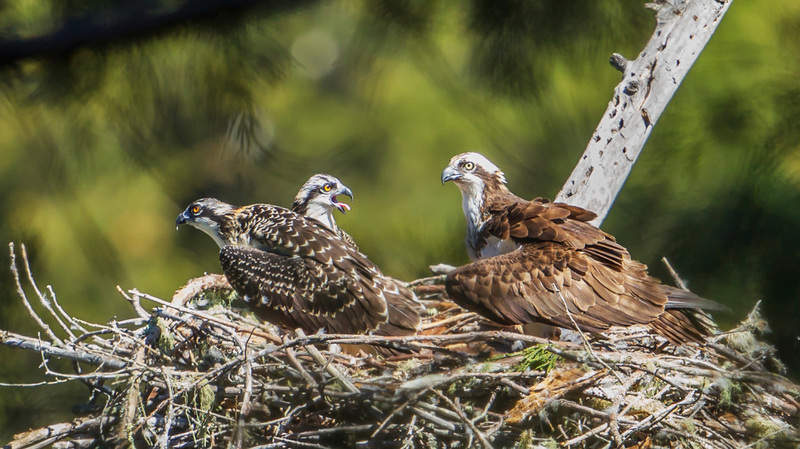 From the ospreys' behavior, I assume there are eggs in the nest now, but I can’t actually see them without the benefit of a flying camera drone (not kidding; this is being done routinely now. Yikes.). The male and female were taking turns – one in the nest and the other mostly perched and preening on a high branch about 100 yards away. After about 45 minutes, the away parent would return to the nest and they’d trade places. 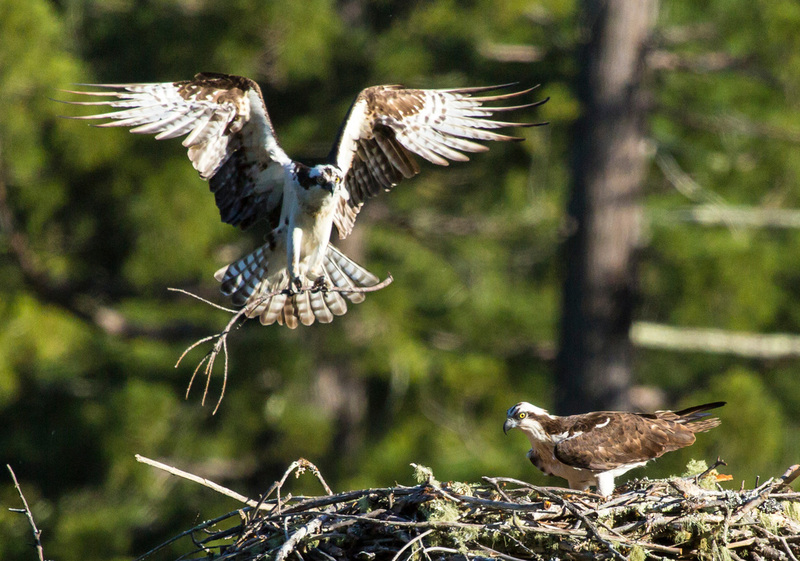 In this photo, the male is delivering a twig to the nest. After the delivery, they both participated in installing the addition. Then the female departed for her time-off. This pattern of shift-changes means that most “photographically interesting” things are compressed into 10-15 second periods at 45-minute intervals. DOWN IN THE CAVE, I was experimenting with cameras and flash units this morning when I decided to put some seed onto an old bird house that’s mounted on the top rail of our west-side fence. Julie made that bird house when she was in kindergarten. It would be cool to attract some spring tenants to this historic structure. I store seed for our bird feeders in a deck box just outside my office door. When I opened the box, I saw a solo yellow jacket worker building a nest. 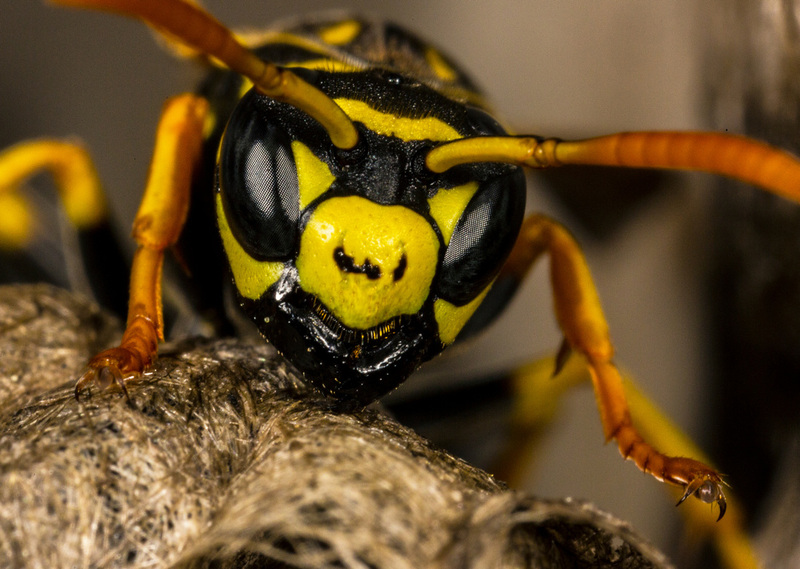 The sight of the yellow jacket triggered a profound visceral response. 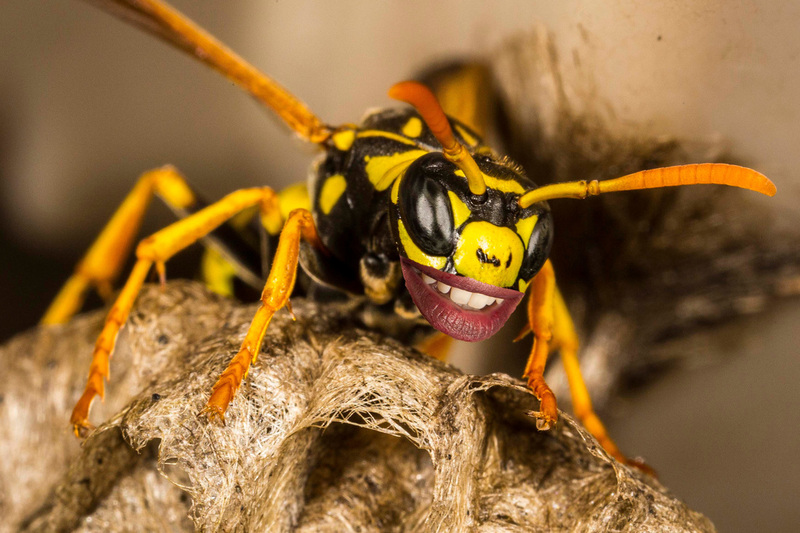 From the deepest regions of my limbic brain, ancient structures -- persisting almost unchanged through 100s of millions of years of natural selection -- delivered a clear message to my modern consciousness: “The yellow jacket is not a threat. It represents a photo op.” So, I set up two remote flash units to light up this lovely creature, mounted the “microscope” (MPE-65) lens on my camera, and shot a bunch of pictures. 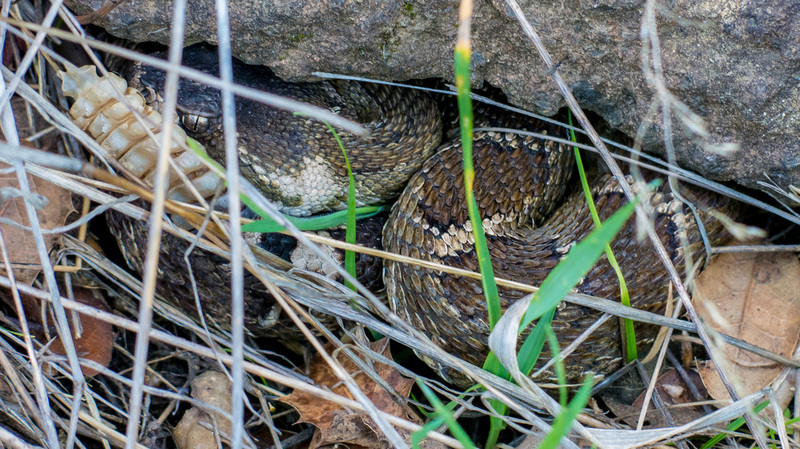 While hiking today on Pine Mountain FR near the junction with Oat Hill FR, We came across a couple with two dogs who were watching a rattlesnake. Upon our arrival, the 30-inch snake was stretched out straight, calmly basking in warm afternoon sun in the middle of the road. It seemed unperturbed by people and dogs just a few yards away. Eventually our dear snake took up a defensive position under a rock, but the rattling continued. I took the picture (above). Its camouflage is pretty effective, but you'll see the eye and tail (with a 7-segment rattler) in the upper left of the photo. It might take a few seconds of close examination to make out the head and neck, but you can clearly see the narrowing of the neck just behind the head (white scales). After a while, we left the snake and continued on our way, leaving the fire road to take a narrow (unofficial, unmarked) trail back to the car. With confidence, I led us into an impenetrable dead-end tangle of poison oak-manzanita brambles (not for the first time), so we turned around and headed back to the car the way we came, taking us past the "snake rock" about 30 minutes after we'd been there the first time. I couldn't see the snake, but I was thinking "Maybe I'll just turn over this rock and have a look". As most of you know, my hearing is pretty bad, so I appreciated my buddy's casual and relaxed commentary from a few steps behind me: "Um, Dave. I hear RATTLING when you get near that rock." I didn't hear anything. Amy gave me a ticket to attend a workshop at the California Academy of Sciences in Golden Gate Park. I arrived there this morning with my camera and some time to spare, so I had the opportunity to take the attached photos of this major CalAcademy superstar. 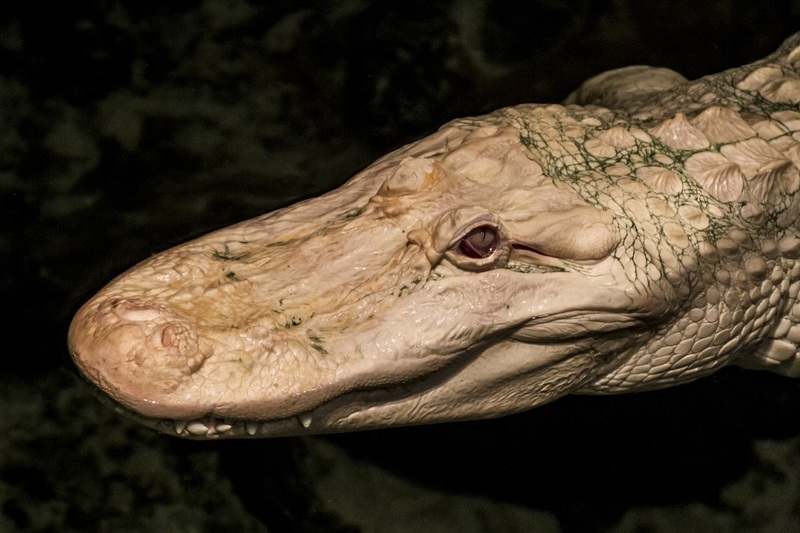 Claude is a very rare albino American alligator. 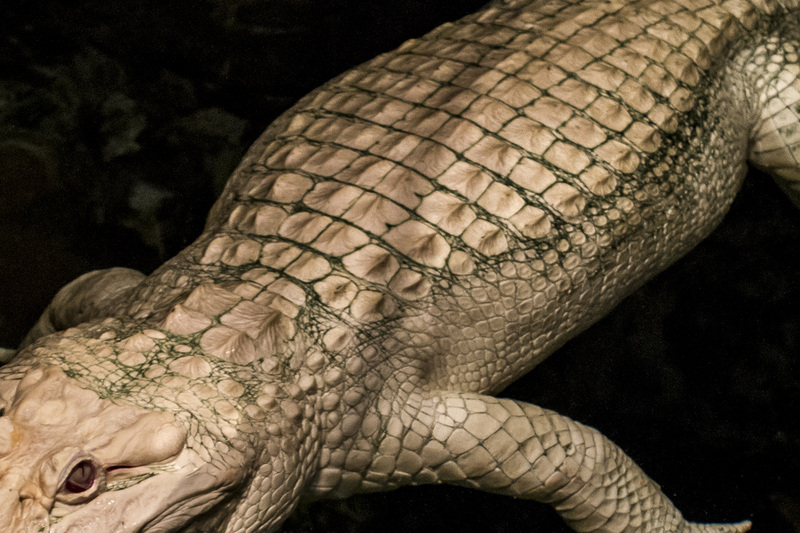 Although full-grown alligators don’t need to worry much about predators, albinos (of almost any species) normally do not survive for long in the wild. They are spectacularly un-camouflaged and easily taken as prey when they’re very small by larger creatures. Well-fed and adored by his fans, Claude is 18 years old and is likely to live another 60 years. The second photo shows more of Claude’s amazing skin. He doesn’t need any tattoos or piercings to look cool. Only very bad people would even think of cowboy boots while admiring Claude.